Knowing how much to tip and when to tip is very handy when you’re enjoying a safari in Africa. You’ll be confronted with the decision almost daily. It will certainly reinforce what a great idea it is to bring many small notes with you, and also save your small bills of local currency for tipping purposes. In many of the popular safari destinations, small US$ are perfectly acceptable to use when tipping. In South Africa local currency, (the Rand) is best for tipping purposes. The biggest tipping dilemma is usually not so much about when to tip, but about how much to tip. What’s appropriate given the economy in the country you are visiting? A $5 tip per bag for a porter may seem extravagant in a country where that could purchase enough bread, rice and milk for a week. If possible, we suggest visiting a local grocery or asking around to find out what the average local meal would cost to make. Translate that back into what you are familiar with, and use that number as a base. Tipping too little is worse than tipping too much. If you tip too little you’ll end up short changing the people who probably need your tip the most. When you tip, your money goes directly to local staff and therefore into the local economy. Tourism plays an important role in many African economies, and at African Portfolio we believe strongly in trying to bolster the local economy, whenever and where ever we can. 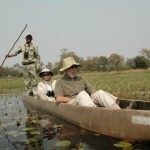 Safari Camp / Lodge and Specialist Guides: If the guide has done a good job, we recommend US$5-$10 per guest per day. The General Safari Camp / Lodge Staff: We recommend about US$3-$5 per guest per day for safari camps. This should be placed in the communal tipping box to be distributed equally amongst all the staff at a later stage. Hotel Staff: Please allow between US$1-$2 per guest per day for hotel staff, i.e. housekeeping, etc. Porterage: We recommend about US$1 per bag. Mokoro Paddlers, Trackers and Butlers: We recommend that each paddler and/or camp/lodge tracker and/or butler receive US$3-$5 per guest per day. Restaurants / Hotels: 10% is customary on meal accounts but only if you are satisfied with the service. Use the guidelines above to get an idea of when it’s appropriate to tip. Tipping children is never a good idea, even if they have helped you find your way. The minute you tip a child, the temptation (or even family pressure) for them to not attend school can become too appealing. If you experience an act of spontaneous kindness (and you most likely will many times) then find out from your guide if it’s appropriate to tip, or if the person would feel insulted. An offer to buy lunch, or “help with school fees” or something of that nature, may be appropriate too. ← There’s a Cheetah In My Car!